Sun, 29 Aug 2016 at 8:17 p.m. Message: Misinformation on the causes of the June 2015 South Dunedin flood have abounded since the event. As if the victimised residents haven’t suffered enough from others’ inactions (before and during the event), they are now being subjected to a hazards discovery process whose vigour appears to be exceeded only by its own recklessness. Following are a commentary of the hazards approach adopted by the Otago Regional Council (ORC), and a summary of my investigations into the flood event that I commenced after the publication of Dunedin City Council’s first flood report back in November 2015. You can download Neil Johnstone’s report or read it below (formatted slightly differently to suit the WordPress template). There is some irony that DCC and ORC should be planning “drop in” sessions for residents in respect of South Dunedin hazard issues during September 2016, some 15 months after the major flood. The prime cause of flooding in June 2015 was DCC’s failure to maintain its infrastructure (not just mudtanks), and its failure to operate its pump stations to their intended capacities. The subsequent spread of misconceptions (i.e. groundwater levels, rainfall significance etc) surrounding the flood causes was at least partly due to inaccurate ORC analyses and reporting. Repetitive and new doubtful information emanating from ORC via its latest report has been noted. Presentations and an over-simplistic video production have been observed. A footnote covering these observations is included at the end of this appraisal. 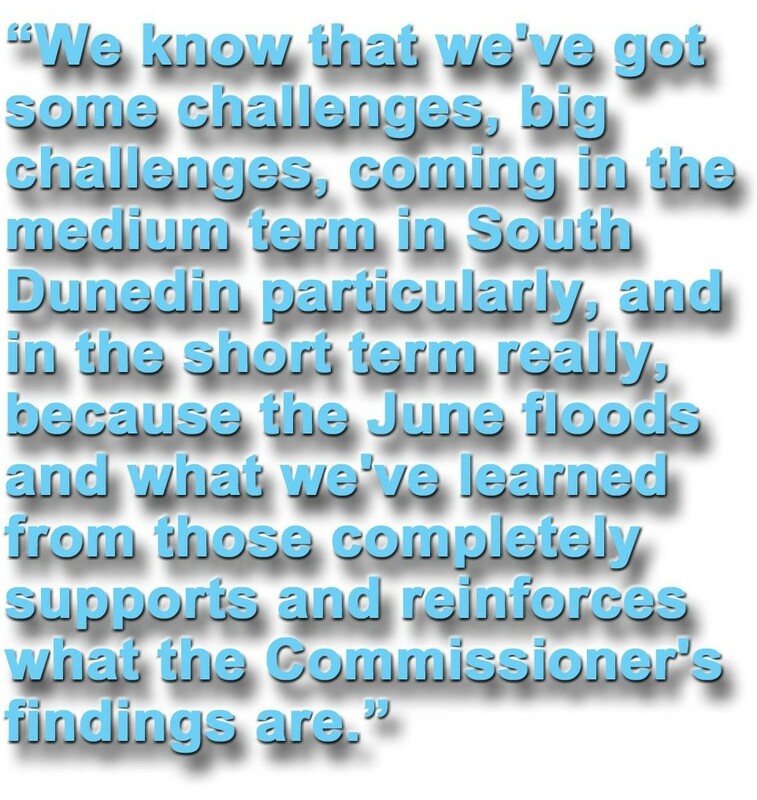 Long-delayed DCC reports on causes of the South Dunedin flooding have already been strongly criticised by the author. Specifically discredited are misrepresentations of sea level, groundwater and rainfall ranking. Accepted now by DCC as factors (somewhat grudgingly, and depending on the audience) are mudtank blockage and Portobello Road pump station failures (plural); still to be fully acknowledged are the failures at Musselburgh Pumping Station. Attention is now turned to significant parts of hazard reports produced by the Otago Regional Council and utilised by DCC. 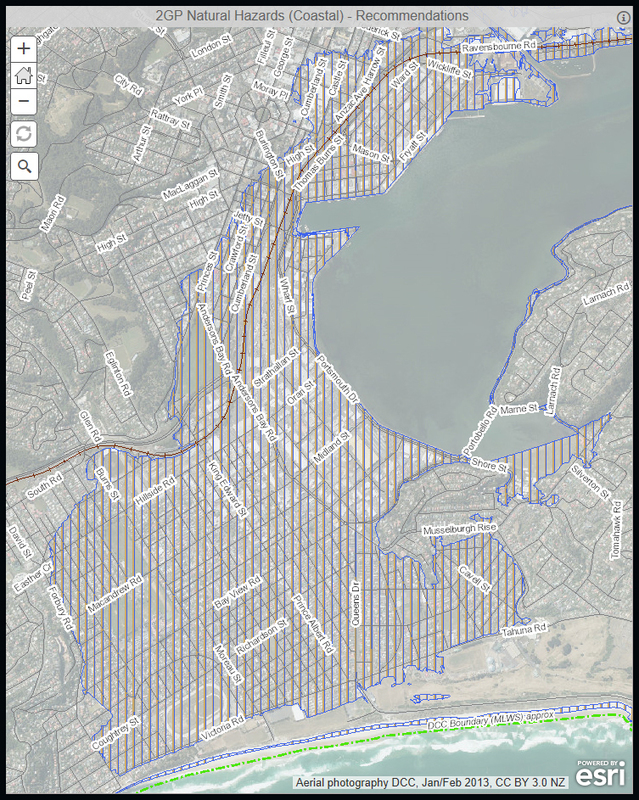 This report deals with a wider area than South Dunedin. It is apparent that ORC staff never visited the flooding areas of South Dunedin on 3 June, but took advantage of fine weather to take some water level readings the following day. The opportunity for useful progressive surface water level recording was thus lost. Levels were collected at some 150 points on 4 June. ORC’s main conclusion was that “localised variations in topography were probably the main driver of flood depth”. Or, put another way, water depth was deepest where the ground was lowest. This seems hardly surprising, and even trivial. No attempt was made to explain the photographic images presented of extensive ponding remaining well after the rains had ceased. The phenomena of blocked mudtanks and unutilised pumping capacity went seemingly unnoticed. The report does usefully reference ORC’s four borehole recorders of groundwater, but makes the somewhat misleading assessment that groundwater levels were “elevated” prior to the rainstorm. This misinformation was seized upon by agencies such as DCC and the Office of the Parliamentary Commissioner for the Environment to highlight climate change impacts. Having obtained the actual groundwater level data from ORC via the LGOIMA process, the author was able to reveal this “groundwater fallacy” in reviews from February 2016, but it was not until the publication of NZ Listener’s article (June 11-17, 2016) entitled ‘FLOOD FIASCO’ that ORC admitted that pre-flood groundwater levels were in fact “just a little bit above average”. ORC now seems intent on resurrecting this fallacy. The ORC report fails to address the real and key issues of pumping station failures (Portobello Road and Musselburgh), or comparisons with much lesser flood impacts in the larger rainfall event of March 8/9 1968. The report states that the 2015 24-hour rainfall was the largest since 1923. This was patently incorrect, but again was utilised by DCC to divert blame from their role in the disaster. The report states unambiguously in its Opening Summary that the major flooding of June 2015 was “a result of heavy rainfall, surface runoff, and a corresponding rise in groundwater”. By now, most people are aware that the causes of the flooding’s disastrous impact were failure to optimally operate pumping stations, failure to clear mudtanks, and failure to deploy staff to key areas during the event. Again, none of these factors is addressed in ORC’s report. – Many recorded instances of rainfall leading to surface flooding. – Heavy rainfall events have occurred frequently over the last decade. Comment: These conclusions do not appear to be supported by the report’s text, and are vague, factually challengeable and alarmist. Prior to 2015, no major flooding had occurred in South Dunedin since 1968, and even that was minor by comparison. – Groundwater level fluctuates (by up to 0.5m near the coast) on a twice-daily cycle in response to normal ocean tides. Comment: All of South Dunedin is near the coast; most of the area does not experience such large fluctuations. This should have been made clear by the inclusion of groundwater data from all 4 ORC sites across the plain, not just from Kennedy Street. – Large earthquakes could result in increased flood hazard on the South Dunedin plain, due to liquefaction-related land subsidence or direct, sudden, changes in land elevation relative to sea level. A report by the Parliamentary Commissioner for the Environment shows Dunedin is one of the most vulnerable areas in the country. █ For more, enter the terms *flood* and *south dunedin* in the search box at right. Shipping giant Maersk, Port Otago’s largest customer, is dropping its weekly direct Southern Star transtasman service to Australia, the country’s largest trading partner. While the financial ramifications for Otago exporters are unclear, Port Otago will lose 10%, or about 22,000 TEUs (twenty foot equivalent container units), during the next year. (16 May) News of Port of Otago’s downgrade filtered through on (Black) Friday. It has yet to hit Otago Daily Times’ reporting with any force . . . we might get some analysis if we’re lucky, or interested. Two cosy words that when read together spell no accident. It’s been in the offing. Maersk has pulled the rugs on a number of New Zealand ports, Otago included – no doubt to ratchet lower port charges, not merely to facilitate freighting of New Zealand exports into Asia. It’s far from clear what the costs of reducing local ports of call (in favour of long distance trucking and rail freighting to the North Island’s port of Tauranga) will be for exporters in the Otago Southland region. We noticed, with suspicion, it was Lyttelton that walked away from a merger with Port Otago. We knew it wasn’t all down to [pretext] #eqnz. We note too – sadly, for the regional economy – that Otago is frightfully good at exporting raw, not processed, logs. Such a very happy picture we have left of what POL is good for, apart from calls by oil boats and cruise liners. We lost transhipping with no warning. Wonder if ORC is ruffled or upset. Who knew. ODT has hidden or failed to surface with the implications of the Maersk decision, preferring to run a diatribe about KiwiRail and “inland ports” for Otago. It’s not as if the subjects are not connected. We expect the local newspaper to make the major news statements and connections palpable, in a timely manner. A whole weekend has elapsed. Further, Maersk’s decision is in no way surprising, there was ample time for ODT to research the background. Clues. Fonterra has been using POL logistics to prototype and determine how inland ports can be rolled out across New Zealand. Worries. Port Otago has been on an export ‘growth wave’, not of its own making, for some years. Does the port board know how to create growth of its own or diversify its activities to meet the challenge dumped on it by (cosy) Maersk and Fonterra? Did the port company properly attend to risk management before Black Friday? (Aside) POL chief executive Geoff Plunket reiterates – as we learned from POL’s Peter Brown a few years ago – the company is of the view that State Highway 88 (Dunedin to Port Chalmers) has sufficient capacity to take all trucking freight. Public safety didn’t come into the equation then, and it doesn’t appear to now. But how many trucks won’t be using SH88 at all in the near future. Lots to think about. Investigation required. News media, DCC, EDU, ORC, Otago Chamber, POL, exporters, port workers, unions, KiwiRail . . . it’s your time to start digging. 21.2.10 So where’s the media explosion? 27.3.10 Why should Port Otago dredge?